Little butterfly. No more than half an inch long. Found him in Las Vegas, NV. Teeny tiny friend. Beautiful Gray Hairstreak butterfly [link to BugGuide]! These are very small butterflies so you normally might not notice, but check out those noses! This is the most common species of hairstreak butterfly in North America, and it is widespread from Canada to Mexico. FYI, in case y’all don’t know about the caterpillar gif blog, I have a caterpillar gif blog. Where I post… caterpillar gifs. 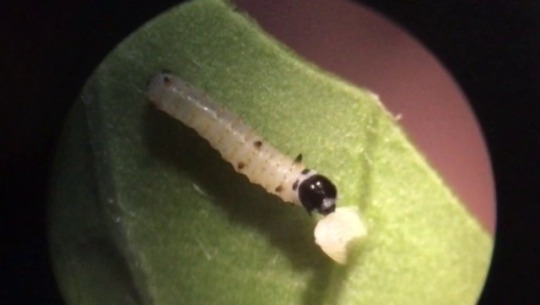 Here is one of the black swallowtail babies who is… taking a bath instead of stuffing his face and growing asap so I can take pictures without using the microscope??? I am too distracted to figure out how I want to handle x-posting so if you want to for sure see all the caterpillar content, keep an eye over there! Black Swallowtail Butterfly Life Cycle! I found three eggs in this patch of parsley, and brought it inside. Today, all three eggs hatched! Compared to the cecropias, these babies are WAY smaller (I forgot how small butterflies started out after all those giant moths!). It usually takes them a day or so to start munching. I hope they grow fast because they are SO tiny and I want to see their cute little faces better! I am but one person with too little time and too many hyperfixations and even though my yard is actually kinda small it ends up taking on a life of its own because hey let nature do its thing, right? What’s the worst that could happen? So, right now, the very back of my yard is a mini-forest of hackberry, elm, and soapberry saplings about chest high (so thick you can’t walk through them without cutting them down, it’s a situation). Behind those, there’s this tangled mass of common hedge parsley and catchweed bedstraw. Both of these plants are terrible. The catchweed is essentially nature’s velcro and it tears into your skin as a bonus. The parsley is fine until is goes to seed—I have clothes I can’t wear until I sit down for a few hours and pick all the burr-covered parsley seeds off them. No, they don’t come off in the wash. The back of the yard is the worst, but the catchweed and the parsley are all over my entire yard (along with the invasive rescue brome grass I can’t get rid of). I’ve been picking as much of it as I can every time I go outside. I want to destroy ALL OF IT!!! You know, like… parsley? She laid several eggs while I watched, and I found three total. I know there’s gotta be more. Well, I guess that’s one host plant I’m not going to fun out of… and I’ve never raised swallowtails before!!! So I put the plants with the eggs inside, and went back to watering. Okay, maybe I don’t hate parsely as much. But I still hate catchweed. GRRR!!! Oh! Hello Mexican Honey Wasp friend! What are you doing over here? I watched this wasp, and… yes. The only flowers that seemed to interest her were these tiny catchweed flowers. Well. I guess I’m not pulling out all of the parsley and catchweed. As if I’d have been able to in the first place. Just goes to show how even “weeds” are essential components of any ecosystem. My current situation is just a gross imbalance of three particular species. Oh hey, that last photo is a Gulf Fritillary caterpillar and I had no idea I’d ever seen one before. Huh! I just found FIVE MORE QUEEN EGGS!!! ^^^ that’s not a queen! That’s a monarch! 7 of the eggs are hatching today!!! The 7 that hatched are all monarchs! Stripes are in! Look how hungry! Since my last update, the number of Monarch caterpillars in my care has grown to more than 20 and I’m still finding more every day. With the Queens, I limited myself because I had finite milkweed and didn’t want to run out. But my milkweed plants have grown, and I know what to expect (these babes are very efficient!). I updated my “tiny baby” habitat to keep them safer and the milkweed fresher. Working great so far! My oldest caterpillars are third instar now. The two close-ups of the baby show him after he molted. His old face is still next to him, and his tentacles hadn’t inflated yet (still curled up like they were under his old skin). There are so many of these things. I am exhausted. The eat so much. They grow so fast. I can’t keep up with them. They’re eating my milkweed faster than it can grow!!!! I came downstairs before dawn because I had nightmares they ran out of leaves and were starving. And my nightmares were almost true—only a few pieces of leaf left! Thy are so fat and so hungry and they won’t stop! I’m going to need to find a wild milkweed source on a roadside somewhere!! When I got home, the babs had eaten EVERYTHING. NOTHING WAS SAFE. I am running out of milkweed. I don’t think I have enough to last *this* batch through adulthood, let alone the 30+ (save me) newborns. So I guess I’m going out tonight with a shovel and a flashlight trying to look 100% not suspicious as I dig up milkweed on the side of the highway. A butterfly club member who runs a private nursery (no pesticides!!) has A Ton of milkweed plants which is good news for the 30 NEWBORN QUEENS. Downside: it’s outside of Killeen. For non-Texans, I will translate: two hours of driving with no traffic (so more like three hours in reality). This is in the morning on a work day. Work commute is just under 2 hours if I’m lucky. Neighbor had a lot of milkweed plants!!! Hopefully I come home to chrysalis apocalypse instead of naked stems. These plants will only last so long, and I still have the batch of newborn baby Queens and Monarchs to feed. So I bought more milkweed! My Snowberry Clearwing hookup got a ton of brand new beautiful swamp milkweed plants 😍 Hopefully they survive the caterpillars! I lost a lot of sleep over these babes last night, but what’s new? There was pesticide residue on at least one of the plants from my neighbor. I should have known better 😥 I rinsed off the plants but there were so many and I was so tired that I didn’t wash with soap and water like I usually do. I lost five of my babies last night, maybe more today. I won’t post the photos of them since pesticides are so horrible that seeing what happens to the caterpillars is more traumatic than any horror movie. I’m so sad I almost stayed home from work. I didn’t have all the babes together, so the smaller ones were not exposed. After days and days and days of nonstop anxiety attacks, FINALLY I came home to some good news. Two babies pupated safely! Three more are putting down their silk pads! They hadn’t eaten all their leaves! Some momentary relief!!! Most of them are ready to pupate or have pupated already. Babes are still eating my milkweed to sticks (so hungry) and they are still cute and tentacly (??) buttheads. Down to the last two Monarchs (from this batch, still have a couple smaller babies). The rest are these weird green things hanging from the ceiling! I put a light behind one of the chrysalids so you can see it’s mostly filled with liquid! I’m so tired. Monarchs are exhausting and hard to raise. Why is this the species beginners start with?!? I need to plant some milkweed seeds and grow the entire plant indoors, because even though I wash all my leaves with soap and water before every feeding, I am still bringing in the horrible black death disease (on top of the pesticide residue from the neighbor’s plants that claimed some of my babies). I am ready for a break, jeez. The first two Monarchs are here (and my last three are about to pupate). Based on raising both Queens and Monarchs, I can safely conclude that Monarchs are testy little turds why would anybody want to raise them?? I have never had a CATERPILLAR angrily BITE ME before when I tried to break up any one of countless caterpillar fights. It’s too bad Queens have such a restricted range! The enclosure is absolutely covered in chrysalids it’s hilarious. Newborn Queen caterpillar cannibalizing unhatched sibling’s egg.